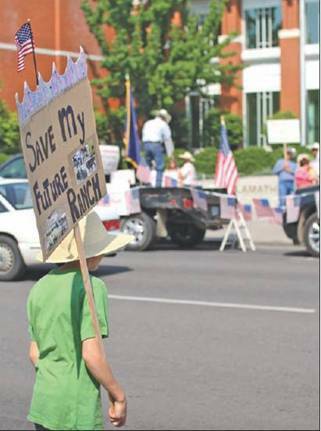 Briggs and ranchers from around the Klamath Basin rallied Monday from the Klamath County Fairgrounds to the courthouse. They drove through Klamath Falls in a long convoy of trucks, semis, hay trailers, cattle trailers, tractors and nearly every other type of farm vehicle. At the courthouse, about 500 people waited with signs, cheering the convoy. 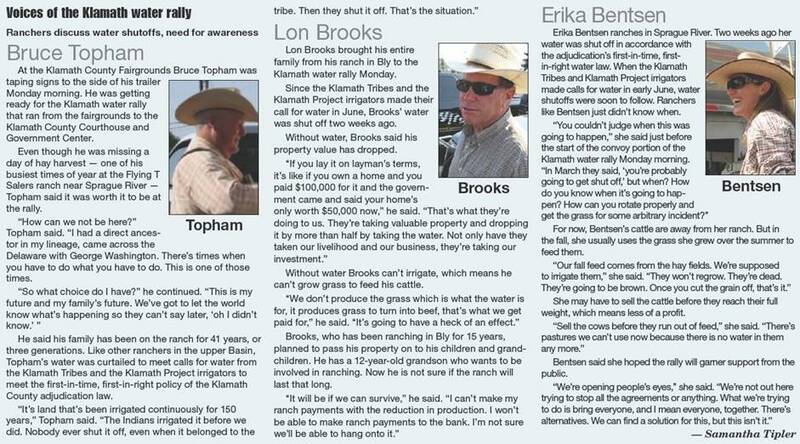 Ranchers were making a statement: If water is shut off, it will hurt the Basin. It won’t just hurt the ranchers who may have to sell their cattle early or move the animals out of the area, it will hurt all of the local economy. The Klamath Basin isn’t the only place paying attention. The state and nation are watching Klamath. He commended the grassroots effort that put the rally together in only a week’s time. He believed Monday’s events will have a big impact across the nation. Ray Sessler, president elect of the Oregon Cattlemen’s Association, said water shutoffs in Klamath Basin ranching will affect the state’s $868 million cattle industry. He also hoped the rally would help inform people about how adjudication will affect their daily lives, via the cattle industry. “People need to understand, how does their food get to Safeway? How does it get there? Look at this,” he said, motioning at the cattle trucks driving by and the protesters lining Main Street. “My God. All three Klamath County commissioners attended the rally. Klamath County Commissioner Tom Mallams commended the rally on its peacefulness. 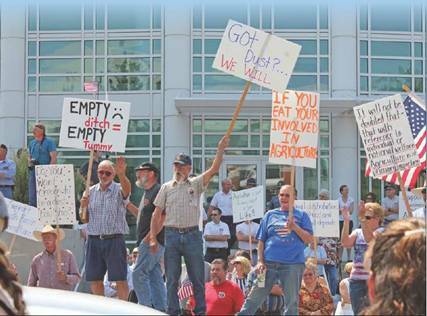 Protesters shout and cheer at the Klamath water rally Monday morning. 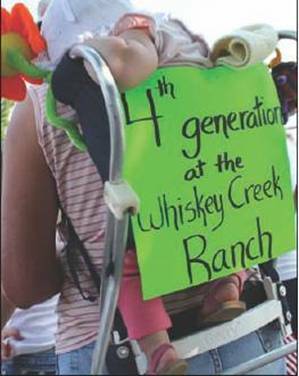 Below, the focus for many protesters was preserving the viability of ranching for future generations.